Scores for voice, individual instruments and chamber music are located on the free standing shelves on the upper level (TP, TPJ). Miniature scores (study scores) (TP 782.77) are located on the lower level in Room L5 (closed access). Loan policy: single copies circulate as regular scores, BUT you need to ask for the item to be fetched from the AV room. Loan policy: single copies circulate as regular scores. 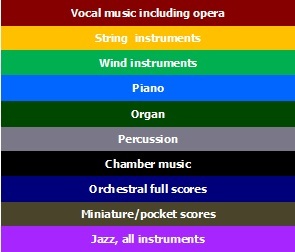 Western Classical Music orchestral sets (scores and parts): located in L5 (closed access) (TPS). Please consult the database on the library's homepage. Loan policy: circulated to orchestra directors only; individual parts may be borrowed for use in the library only. Loan policy: circulated to big band directors only; individual parts may be borrowed for use in the library only.